Congratulations! You have landed an interview for a nursing or medical position, and you are spending some time to get ready. It’s always a good idea to review typical interview questions and answers for the type of job you are applying for. Reflecting on questions, and devising ways to answer them will help you arrive prepared and confident for your interview. Interviewers ask different types of questions to determine what kind of employee you will make, and whether you would be a good fit for the company and the position. Keep your answers focused on your assets and project a positive image. When giving your answer, use an example of when you encountered a similar situation that had a successful outcome. If you can share a concrete example that shows you've got the qualifications the interviewer is seeking, you'll up your chances of getting a job offer. Here are sample answers to the common questions you might be asked during a nursing job interview. You will also want to be sure to dress appropriately, know your worth, and understand the requirements of the position you are interested in. 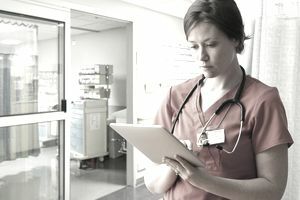 If you are returning to the workforce after a break, here's how to get your nursing career back on track. Here are some sample answers to the nurse interview question: "What do you find difficult about being a nurse?" Remember to express your response in a positive manner, using the difficulties to highlight positive attributes in your resume and personality. Sometimes I find it difficult to leave work at work, as I tend to become very involved with my patients. I feel that it’s my responsibility to care for them as I would my own family, and I try to make sure that the other nurses on the case know all the details so the patient receives the best care during their entire stay at the hospital. I think the most difficult part of being a nurse is when I have a patient that is very unhappy, or in a lot of pain, and I can't comfort them to the degree I'd like. I keep a dialog going with the attending physician so that she has as much information as possible regarding the patient’s pain level. Sometimes the patient doesn’t effectively communicate with the doctor, and I try to help bridge that communication gap. I prefer to look at difficulties as challenges, and I enjoy conquering challenges. I once had a patient whose family was very difficult to communicate with. They were somewhat combative when they would deal with the nursing staff and always insisted on paging the doctor when they had a routine question, even though they were meeting with him on a schedule during the duration of the patient’s stay. I was able to gain the trust of the daughter, and I scheduled a daily meeting with her to update her father’s condition and response to therapy. She appreciated having a point person and became much less demanding of the doctor’s time. When I first started as a nurse, I found shift work to be very difficult. I had young children at the time, and scheduling revolving child care was very challenging. My kids are older now, so I don’t have that stress anymore, but I would still say that rotating shifts can be one of the tougher aspects of a position. Although, I have found that your colleagues can have a huge impact on how challenging it is. At my last job we had such an amazing staff, and supported each other so well, that working shifts wasn’t really a difficulty at all. Review sample answers to the nurse interview question: "Do you prefer to work alone, or as part of a team?" That depends on the circumstances. I enjoy being part of a treatment and support team, but I also like the autonomy of working alone. I believe that nursing in a hospital is a team effort, and I really enjoy making my contribution to the team. You need a certain amount of independence to work without the daily support of a team. As an in-home nurse, I enjoy the one-on-one with my patients. Review sample answers to the nurse interview question: "How would you handle a patient who complains constantly of pain?" I would confer with the attending doctor to make sure that the patient's pain was being managed in the most effective way. I would reassure the patient that everything possible was being done to alleviate their discomfort. I would listen sympathetically to their complaint, reassure them that their concerns were being heard and that we were doing everything possible to help them. I offer my patients the very best care and advocacy I can. I believe that I offer my patients comfort and confidence that they are being well cared for. I feel that my patients know that I am there to provide comfort and understanding, that I will listen to their concerns, and that I will act as their advocate if necessary. Describe a situation with a family where you issues with poor communication. How did you resolve it? How would you deal with a family member who isn't happy with your care of the patient? How do you deal with a family that isn't following care instructions? What's your approach for communicating with a family that doesn't speak your language well? How do you handle a family's questions that are outside of your purview? What's your approach for dealing with families who want to talk about death? Families sometimes want to know a timeline for a sick person. How do you handle that? How do you deal with a family member that wants to blame you? What are the HIPAA regulations in regards to phone calls from family members asking for patient information? How do you handle personal gifts from a family member? What kinds of questions from a family member do you refer to the patient's doctor? How do you help family members deal with death? Sometimes a patient might not want medical information given to family members. How do handle that with them? How do you respond when family members ask for your personal diagnosis? What do you do when family members usurp time you need to allocate to other patients? Here are more questions you might be asked during a nurse job interview, suggested answers, what to wear to a nursing job interview, and medical job interview tips.